This is Melodysheep’s The Big Electron, an autotuned mashup of Bill Hicks and George Carlin. This is catchy and it’s words that I love. And I want you to be able to listen to this so you can see the comic strip too. Applied Mindfulness, Meteors, and Pie! This morning I was reading a post titled “Part 134, Relationship Rules in the True Way, and a Starship Rescue Planned,” by Dr. Kathryn E. May. Go read it, it’s worthwhile. I would post parts, but she prefers that the post remain in it’s entirety, and this is a long response. Maintaining a loving attitude toward everyone around me, all day long, is not a simple exercise. Yes, this is applied mindfulness. Sometimes I have to mindfully remove myself, either physically or just from the conversation, before I start strangling the ones I love. 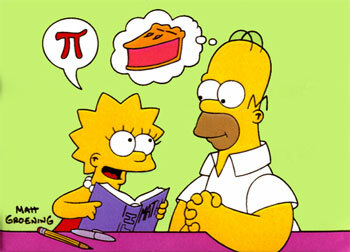 I think my problem lies in that I was partially raised by Homer Simpson. Luckily I was Lisa, not Bart. But we parent how we were parented, and I am ashamed to say that I’ve heard my father’s words slip from my tongue in moments of stress. DOH! Practicing forgiveness is powerful and it starts with forgiving myself. I believe that when my children or my husband annoy me, it’s because they’re reflecting my creation back at me. The things about my son that bug me the most, are the things he does that are just like me. And it’s painful to look in that mirror sometimes. Then I remember that it’s just a fun house mirror, and I’m looking at a terrible distortion of something that really isn’t that bad. Same is true for public encounters. When I’m upset, angry, worried, rushed, or generally snarky, the people around me are too. Rather than get angrier, I’m learning to step away and get myself right again and the angry people seem to disappear from my universe. They can’t stand to be around me apparently. Yay! It’s a whole lot easier to love everyone I come into contact with when they’re lovable, so first I have to love myself and be lovable. In Dr. May’s post, I love the suggestion to get into connection with everyone you meet BEFORE you speak a word. Make eye contact and feel empathy for the person. As I’ve done this, it has cemented the idea that we are all one. I have come across a few that are not of me, or like to think that they’re not. I have come across a few that my intuition said RUN! and I have, no time for questions right then. I went to Dr. May’s post because of the word of a meteorite speeding toward Earth on a direct trajectory that is supposed to hit tonight. Of course, it’s not on the news at all. I am thankful to read Dr. May’s words that we are protected and it will be exploded before impact. I do so deeply hope that this event could finally provide an opportunity for Disclosure. I really like this cover by Heart. Wow! I had to click it just because I couldn’t recognize the Led Zeppelin song by the title. As for the message…I’m waiting with an open mind. It really is the end and activity has already begun. The old grey mare ain’t what she used to be, fellas. That greed will get you every time. It’s a vice that will no longer be permitted. Don’t be shocked when the announcements begin, truth can be a real humdinger, and some won’t even believe the evidence when it’s put at the end of their noses. The ripping down of the ‘Lie’ curtain is happening folks, for the whole world. The C is in the atmosphere now… The pope got it and signed off straight away. Posted in Bigger Picture, Uncategorized. It was like I was flying! Suddenly, I had these ideal children. The most important part, if you find yourself flying is not to question why, but to enjoy the sensation and allow it to happen. 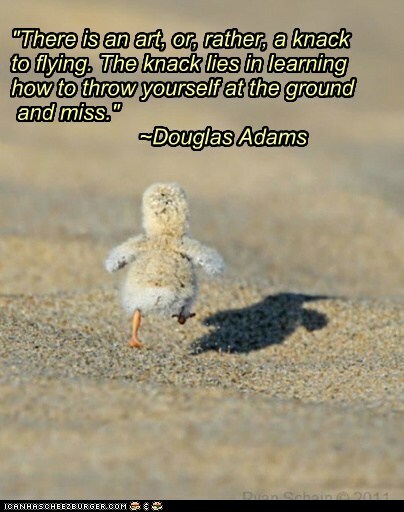 So I quit questioning and focused on how good it felt and said things like, “No, we can’t turn on the TV, but you could sing for me.” Thank you Douglas Adams for teaching me this lesson. I have been asking for peaceful, easy mornings. Apparently, I am getting better at aligning with it and, of course, it affects everyone with whom I interact. Over the last three months, I’ve been really busy and I’m feeling lots of energy moving. Juggling lots of paperwork, making lots of doctor’s appointments, submitting receipts to the healthcare reimbursement form, improvements for my son, new adaptive equipment for my husband, LOTS of networking and support groups, meetings at school. Making travel plans, getting plates & emissions for the car, learning the iPads and researching new apps. There was a point in my life, where trash day was the busiest day of my week. (Oooh, an appointment.) Now, I’m spending entire days out going places. Mostly, I’m feeling good and surfing the chaos. Occasionally I wipeout and it hurts, yet it doesn’t feel as hopeless as it did. I’m seeing major shifting in my personal energy. I do feel down sometimes, but I’m finding that when I do, it’s a sign to take care of myself, usually sleep or food will fix my whole attitude. It’s a learning experience, though, to get the really good times and simply cherish them and anticipate it being like this more often. Allowing it instead of questioning the miracle and causing a massive, painful crash. If you don’t know of David Icke, this is a really light overview of his basic beliefs. I don’t necessarily subscribe to all of them, but his basic philosophy rings true to me. I’m keeping an open mind, and I don’t support pointing and laughing. Russell Brands asks for a sum up, and David says, “Bloody hell, mate. I just spoke at Wembley for 10 hours and that didn’t cover it all.” Later, Russell Brand’s comment, “My cat doesn’t know there’s an internet,” just tickles me. He gets it, but he’s so silly, you could almost miss that he does get it. I’ve been reading about corruption in the Vatican for years. I am SO EXCITED to see something in the mainstream about how the Pope’s butler leaked some “shocking” information. It’s not on a conspiracy theory website, it’s on NBC! Yippee! It’s not just the Pope, it’s Boystown, it’s Penn State, it’s Jimmy Saville, it’s evidence of human trafficking in DC. All these things are coming to the light that were hidden and shameful and abusive, because we are shifting. Before, it was appropriate to keep those things hidden and lots of people conspired to keep it hidden whether they were directly involved or not. Things are changing and it’s not acceptable any longer. Rampant pedophilia exposure is hitting mainstream. And I’ve seen some questioning of the Federal Reserve Bank, and the IRS, in the mainstream. Rather mild questioning compared to the conspiracy theorists, but it’s a start. So far David Icke has been pretty dead on about all the paedophiles in Britain. I find a lot of his philosophy intrigues me and rings true. And I deeply respect him for facing the ridicule he’s experienced. Grande cojones. But, if he turns out to be right about the Queen of England being a shape-shifting, baby-murdering reptile, I’m gonna twitch. Lots of people are gonna twitch. I’m withholding judgement for now. I’m eagerly watching the news these days watching for signs of a shift that I feel is coming. I feel like sanctity of the Vatican has finally been breached and it’s just the tip of the iceberg. Catholic priests are actually being charged, and victims are coming forward. It’ll be okay, we’ll haul it all out into the light and say that’s enough and we’ll all be the better for it. Had this offer not been taken, unbelievably damaging information would have been made public — including video. What we are seeing, in short, is a gradual process of change. Everything is being done slowly, so as not to upset the public too much. 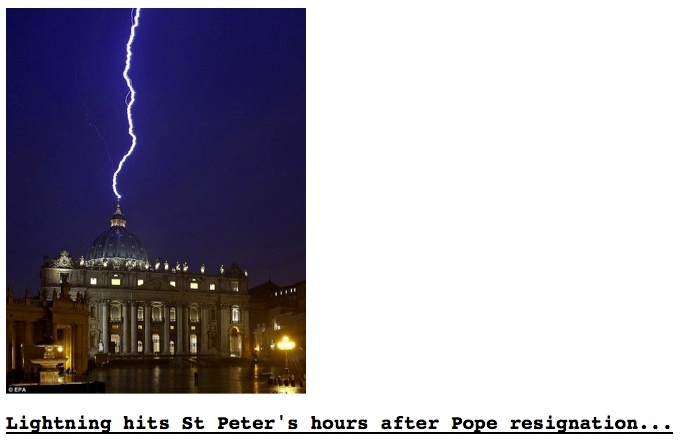 However, the symbol of lightning — once seen in context — is a powerful indication that Benedict’s resignation is a very positive event. You are far more powerful and wise than you dare to give yourselves credit for. Fear and worry create more fear and worry. But gratitude creates bounty and kindness. Over the last several months, I have been researching several topics and some of them are really not pleasant. Sometimes, I’m drawn to things and I find a useful source and start reading. One link leads to another. I’ve read a lot about Monarch Programming, ritual satanism, and the Illuminati. Oh, and paedophilia, as the Brits spell it. One day I researched the Amityville Horror story. Some days it was financial news. These are SO not my usual topics. As I read, certain point would leap off the page at me and go “BING!” I figure that’s the information I went there to find. My dear friend BouncyDragon has worried for me sometimes as I told her bits of this. I got so involved researching the nastiness, that I left the blogging community I was at, because it wasn’t the right place to share that information. Yet, there was a reason that I learned of these things and while I was reading it, it didn’t make me feel afraid or paranoid that these things would affect my loved ones. I don’t have bad dreams, I don’t worry during the day, it has not brought me pain to consciously focus on these subjects. It’s all about perspective. It’s about the fact that I am more powerful and wise than I’ve been taught, and so are YOU! I can sit here, in my office, and quietly direct my power and the universe re-arranges to suit my perspective. I have changed my own life and experimented with this a lot. I created my soulmate in my life, and I’ve literally used my light like a laser beam at negative people and laughed as they crossed the street to avoid it. Such fun! For the last twenty odd years, I’ve been slowly realizing my own power. This perspective shift changes how you live your daily life and face the challenges that come up. Try it. Ponder, how would a powerful being of the light handle this? The fear simply falls away, because as a powerful being who can’t be destroyed, there is no fear of pain, fear of other people’s opinions, or fear of failing. I spent last night giving advice to a SNAG (NOT being insulting here…I like SNAG’s) about talking to women. Sigh. He’s got to first do some self-esteem work and allow himself to feel that he deserves a good partner. Can’t fix him, he had to step into the idea of his own worth. One of the things I told him was to practice talking to every attractive woman he meets AS IF he knew that she wanted him. Eventually, one will believe him and be willing to co-create that reality. My friend of my dearest friend, YOU are far more powerful and wise than you dare to give yourselves credit for! 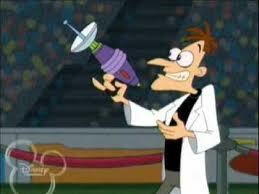 I wish I had a make-people-know-inator. I’d zap them and awaken them to the idea of their own power and confidence. What if everyone woke up and found that they had God-like powers? Would you use your powers for good? Guess what? Thou ART God, grok?